Optical Control Americas is pleased to announce that it awarded Methods Automation as its 2018 Rep of the Year. 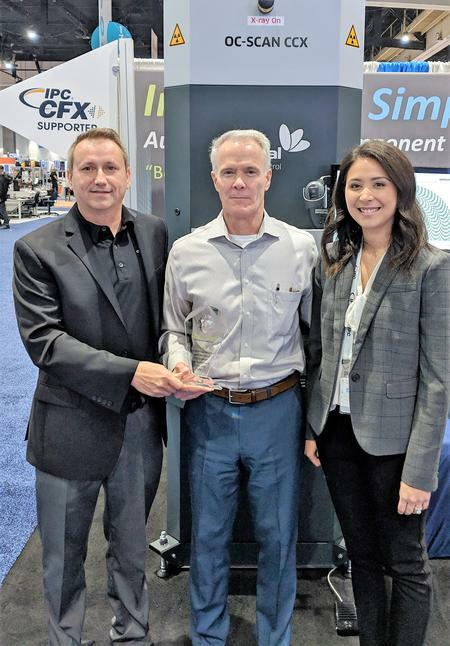 Todd O’Neil, VP of Business Development at Optical Control, presented the award to Scott Cook, Principal of Methods Automation, during the recent IPC APEX EXPO in San Diego, CA. Methods Automation represents Optical Control in Virginia, West Virginia, Delaware, Maryland and Washington DC. To learn more about Methods Automation and the lines they offer, visit www.methodsautomation.com. Optical Control Americas is part of the Elsysko group, a full-service EMS company, in Weißenohe, Bavaria Germany and has 180 employees, four SMT lines, and two throughole lines. The company was founded in 2009 and in 2011, optical control GmbH was formed as a sales and service organization for the CCX (component counter X-ray) products. In 2017, Optical Control Americas was started. For more information about Optical Control, email us at infoNA@optical-control.com, call us at 1-833-WECOUNT (932-6868) or visit the website at www.optical-control.com.